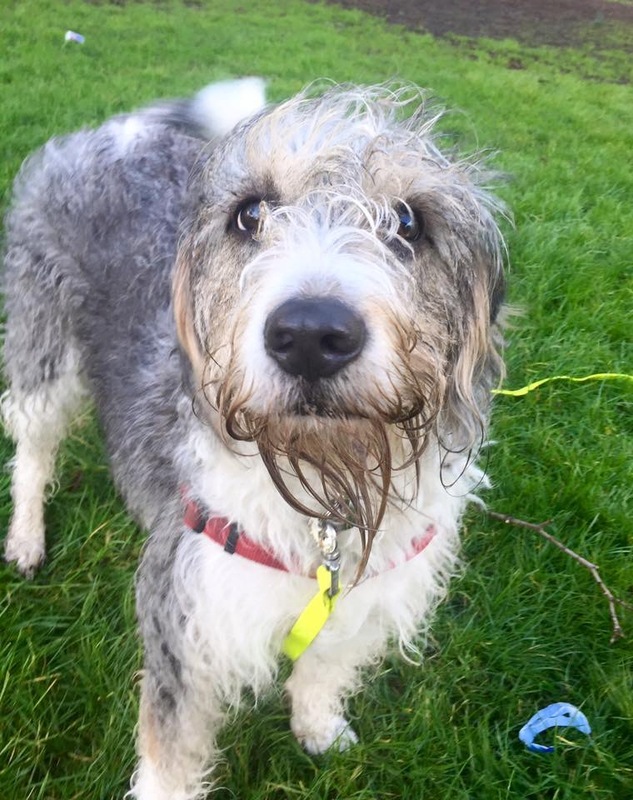 We work with the dog-rescue charity, A Dog’s Life (check out their Facebook page and website) to help support their work in making sure their dogs get the best training and behaviour support. Unusually, A Dog’s Life has a lot of puppies in their care at the moment so that’s a great excuse for us to hold a puppy party in our new place #puppybreath !! 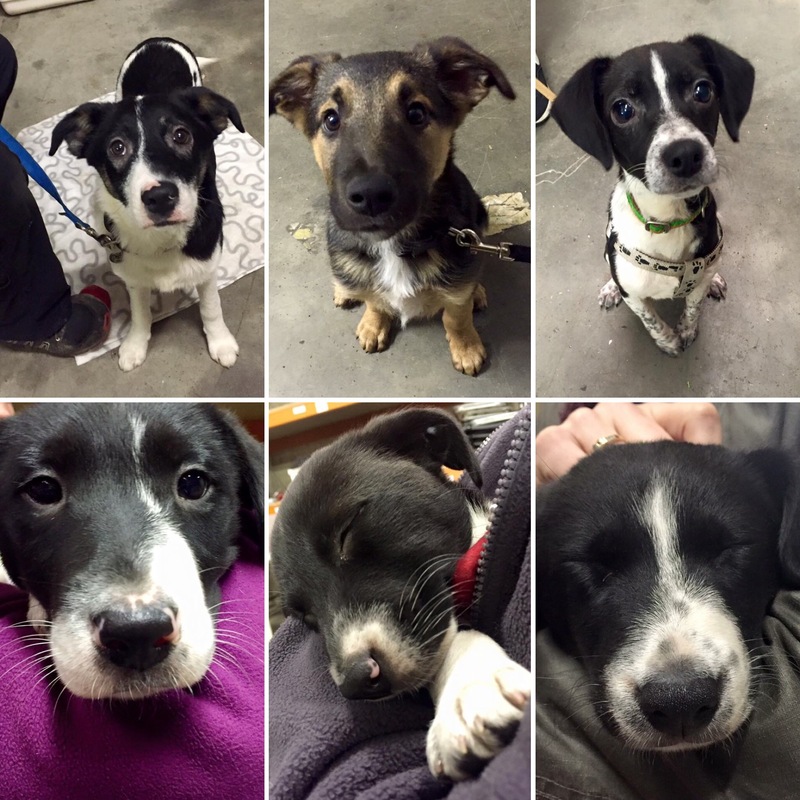 Holly, Rudi, Gertie, Hope, Macy and Toby, along with their awesome fosters came along for fun and brain games. Hope, Macy and Toby are from the same litter so it’s good for them to be exposed to other puppies and to spend some time apart from one another too. In good news, Rudi has found his new awesome forever home!And home checks are in process for Macy and Gertie so fingers and paws crossed! 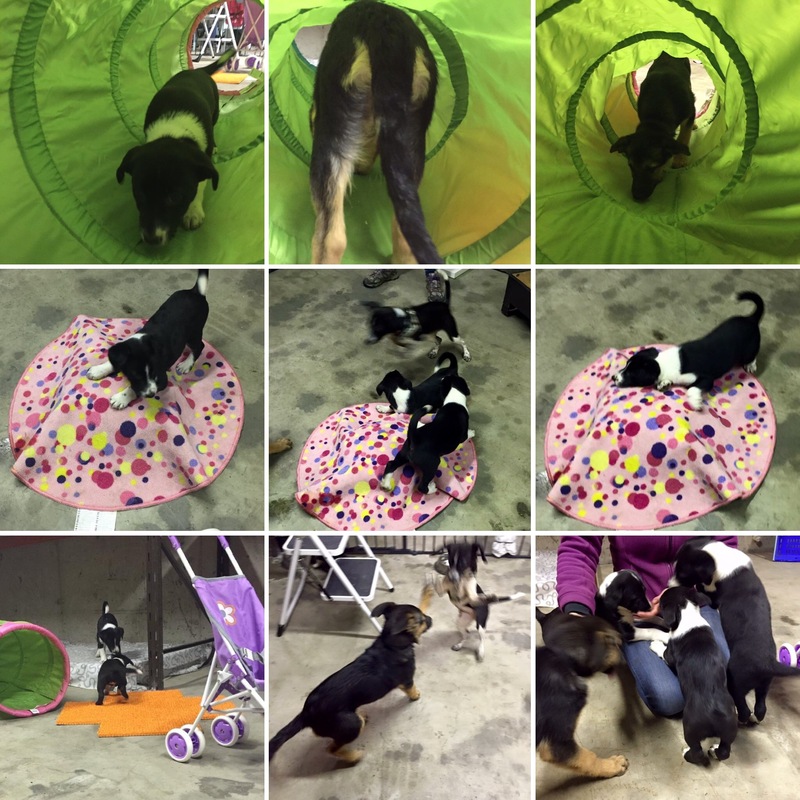 We set up a confidence course behind a barrier so that the puppies couldn’t get into any mischief. 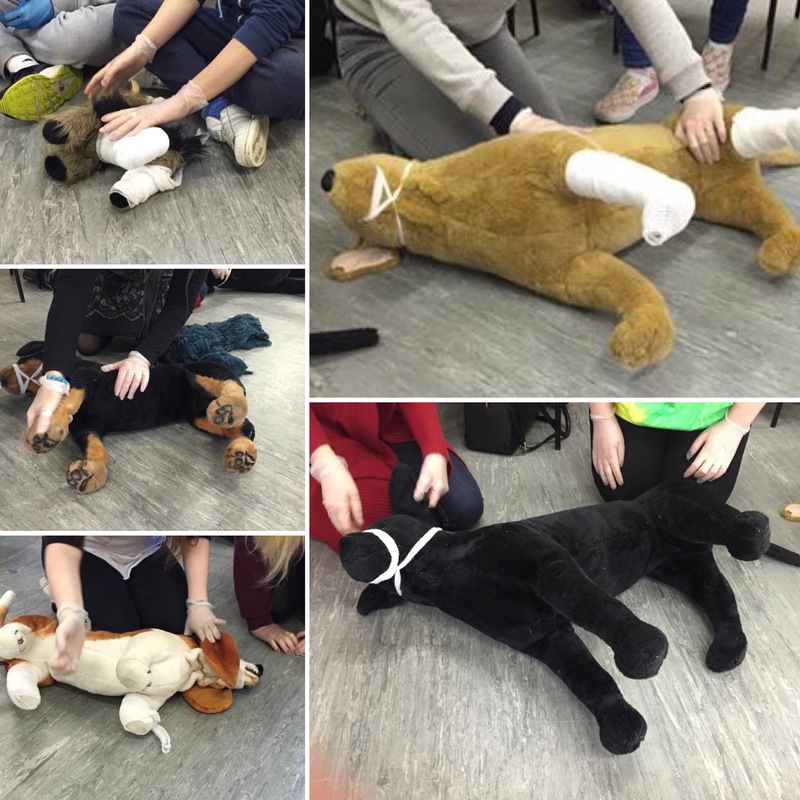 Confidence courses help to expose puppies to odd, novel and out of context items and situations in a safe environment so that we can help them learn to cope with stress and develop resilience. Puppies learn that they can investigate new, weird and even scary things without any pressure, in their own time and they can direct the interaction, with the choice to move away built in. This is confidence building and essential for puppies. 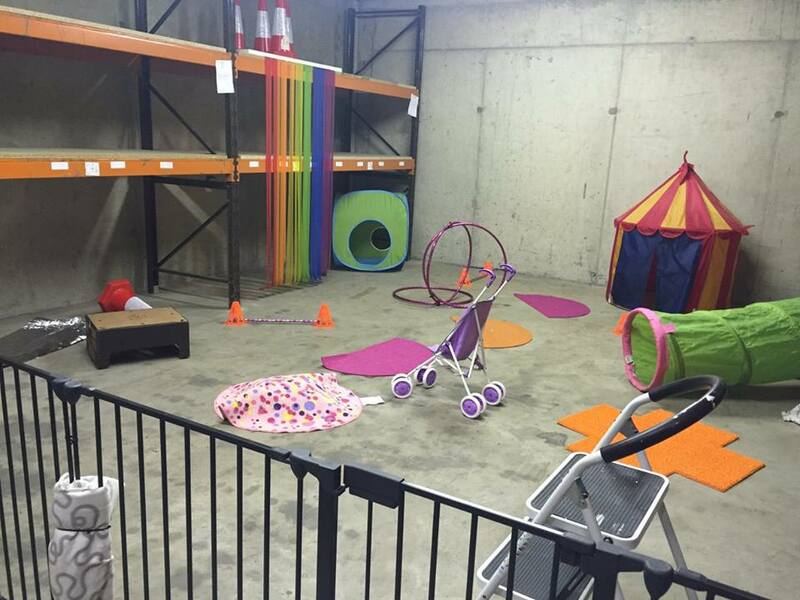 Weird items, things out of context, new substrates, different textures and surfaces, new noises and moving things – all make for a great puppy confidence course! And after some playtime, exploration & investigation, we had some downtime – because learning to settle is one of the most important skills we can teach puppies and dogs. We looked at toilet training, chewing & destruction, biting & nipping, resource guarding, handling and self-settling. lots of enrichment & entertainment – NO food bowls here!! 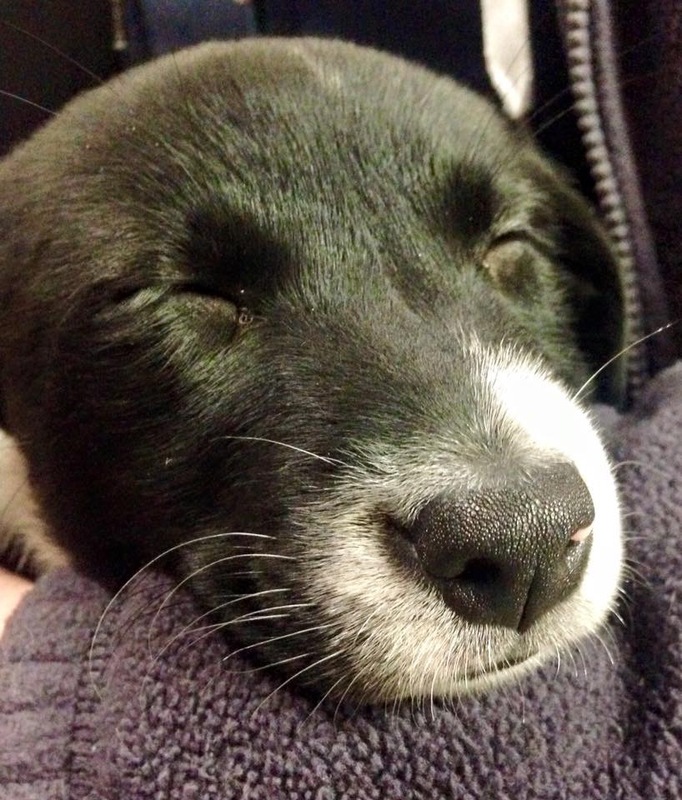 lots and lots of passive training – catch your puppy doing the right thing! What we do now with puppies is having an impact on their behaviour over the remainder of their life; and these fosters have the added challenge of making sure that their puppies become adoptable, successful companions – no pressure then! Follow Me! – teach puppy to follow you and love it, without a leash on first so that when you put the leash on puppy has no reason to pull! It’s no wonder all the puppies were pooped after all that! This week we mainly had follow-up appointments with dogs and their families already working through programs, coming back to adjust the plan we have built together, to build on progress and to keep motivation up! 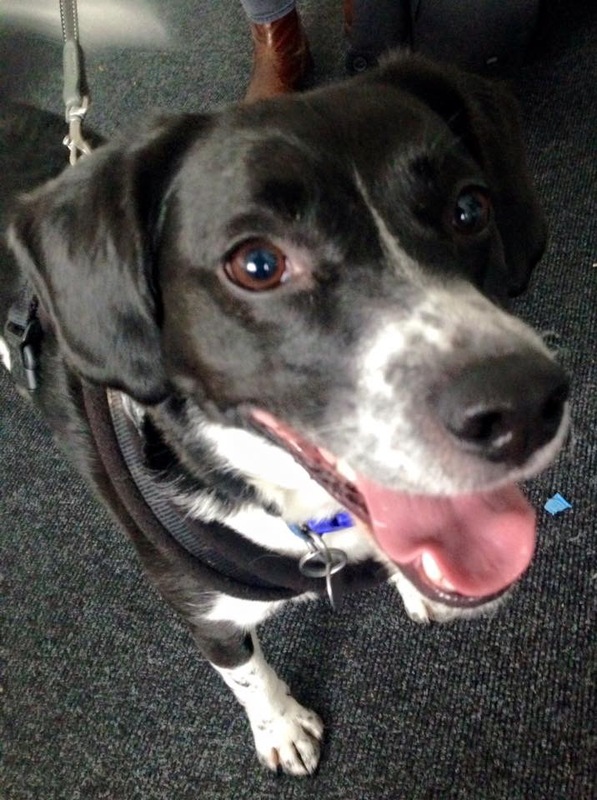 Harley came for a second follow-up as his people work through the program we have built together to help improve this little chap’s self-control, focus and coping abilities. He’s a super smart fella! We were out and about with Shiloh for a third follow-up in the wind and rain (normal Irish weather!) to help her learn how to better cope with some specific fearful responses. Despite us all getting a bit bedraggled, Shiloh and her mum make an awesome team! 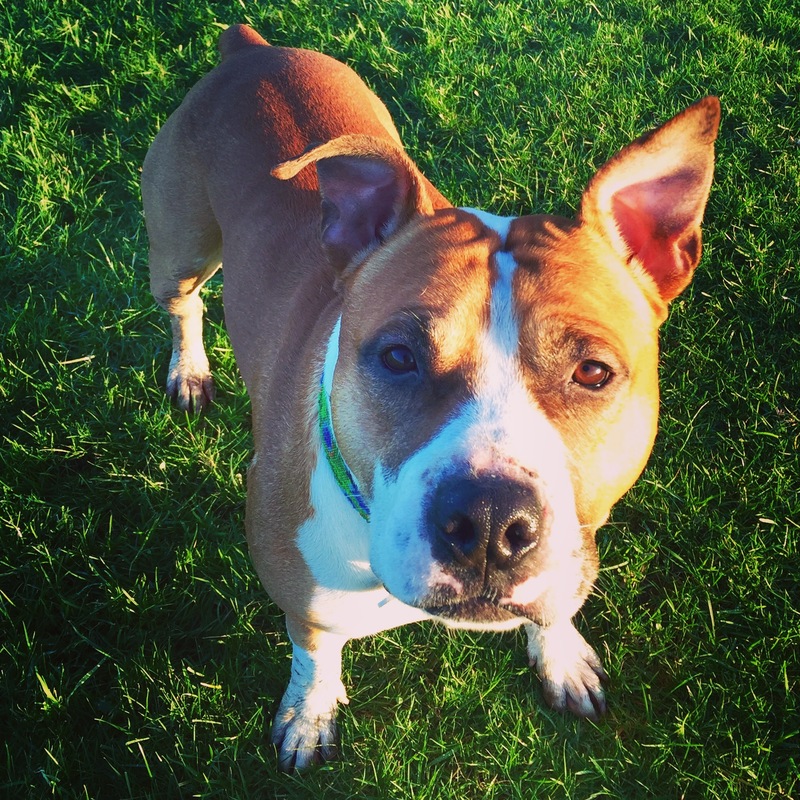 Shy girl Roxy came for her first follow-up – she and her people are rocking our program to help her confidence develop. She is becoming a cheeky little one! Despite being scared of the mat at first, soon she was able to lie on it comfortably. 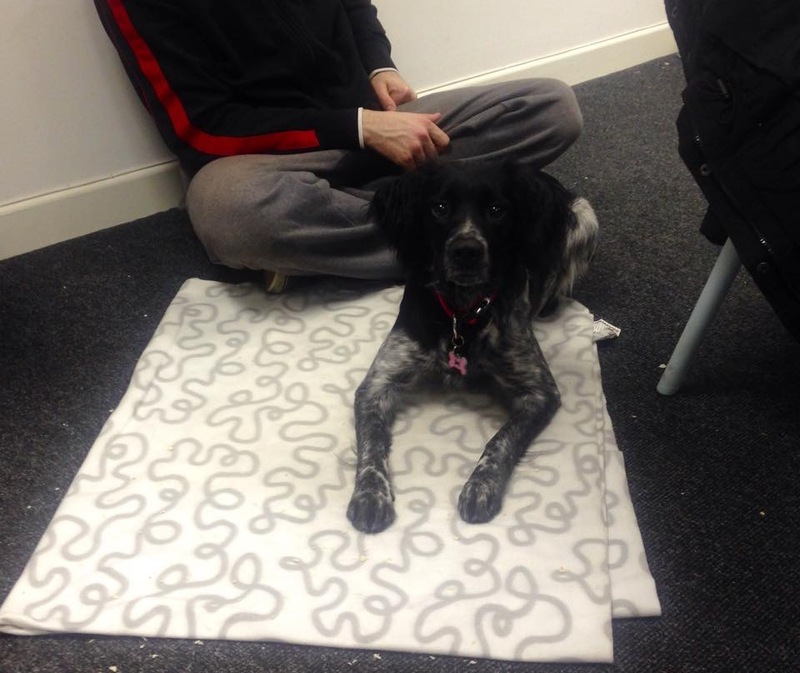 Her dad helped by giving some support (sitting beside it neutrally) but Roxy was soon able to interact and lie on the mat with shaping, lots of choice and salami! Lottie came for a visit too and we did some dog-dog comfort work. Lottie and her person did some awesome training, never allowing Lottie to become uncomfortable, always able to work and really closing the gap with our stooge dog (Decker)! 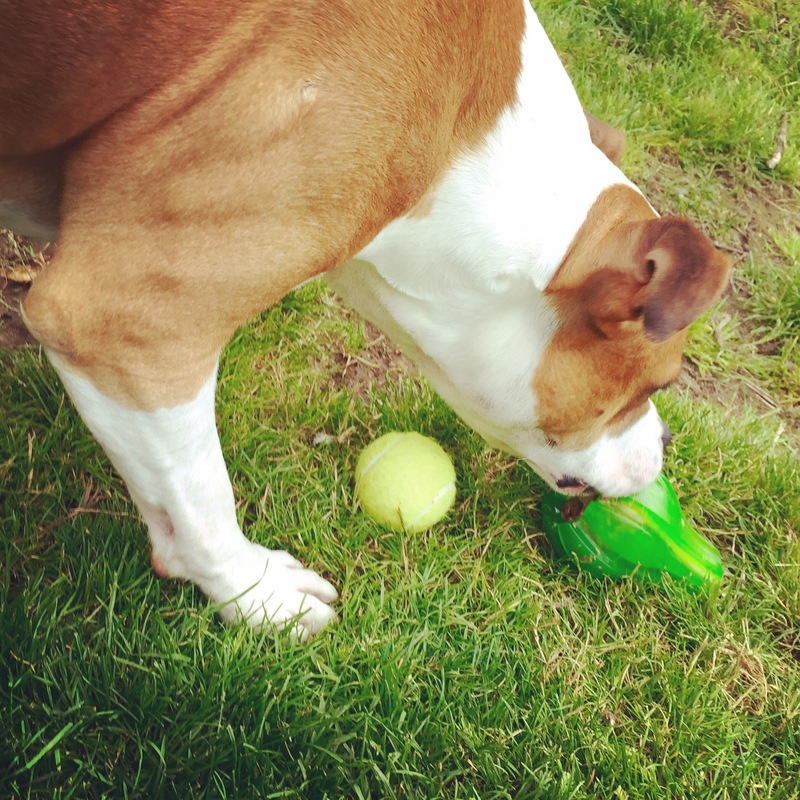 After we did some training work, Lottie worked on a puzzle – getting her dinner out of a plastic milk jug. And Lucy Basset popped into say Hi!, check the place out, have a game with Decker and pick up a crate for her new foster brother Mason, who she will be helping to become a great adoptable pet! We are celebrating because our CBTT3 group all completed their full course successfully! Yay!!! 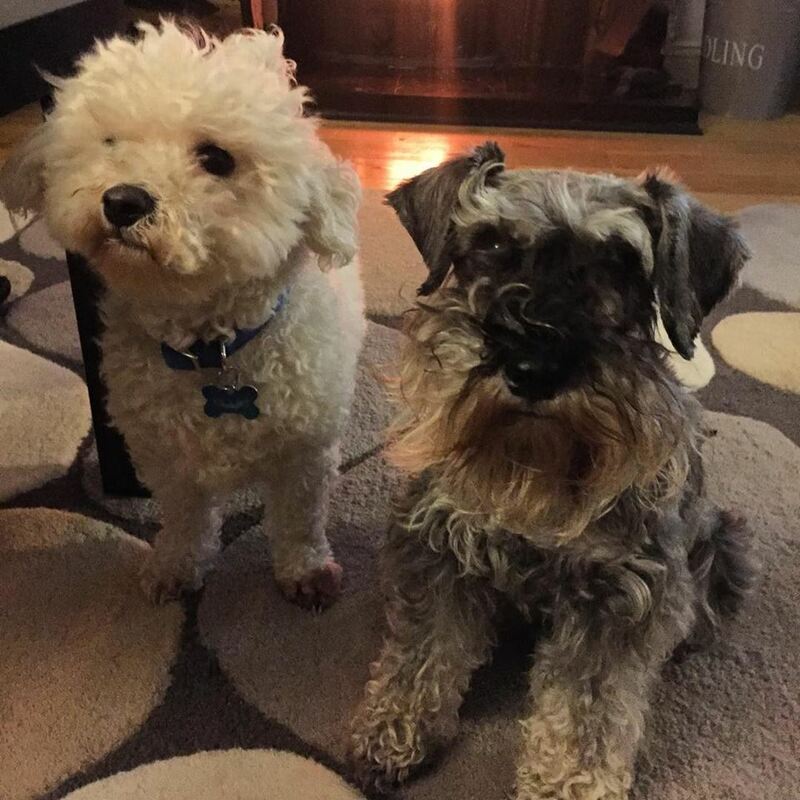 They have completed 15 units at first-year degree level, battled with an enormous workload and still love dogs, training and behaviour at the end of it all. Now the really hard work starts as they build their careers as fully fledged Canine Training & Behaviour Technicians, with our continued support. We are beyond proud of all that they have achieved as they embark on becoming excellent dog pros! And our trusty pack of Labs, Bassets, Rotties, Yorkies, JRTs and Beagles (don’t worry, they are all well-behaved teddies!) are very tolerant models helping lots of learners become Canine First Responders. Zack wrapped up – t’was cold this week! Lots more to come with a busy weekend ahead and another week of doggy adventures! 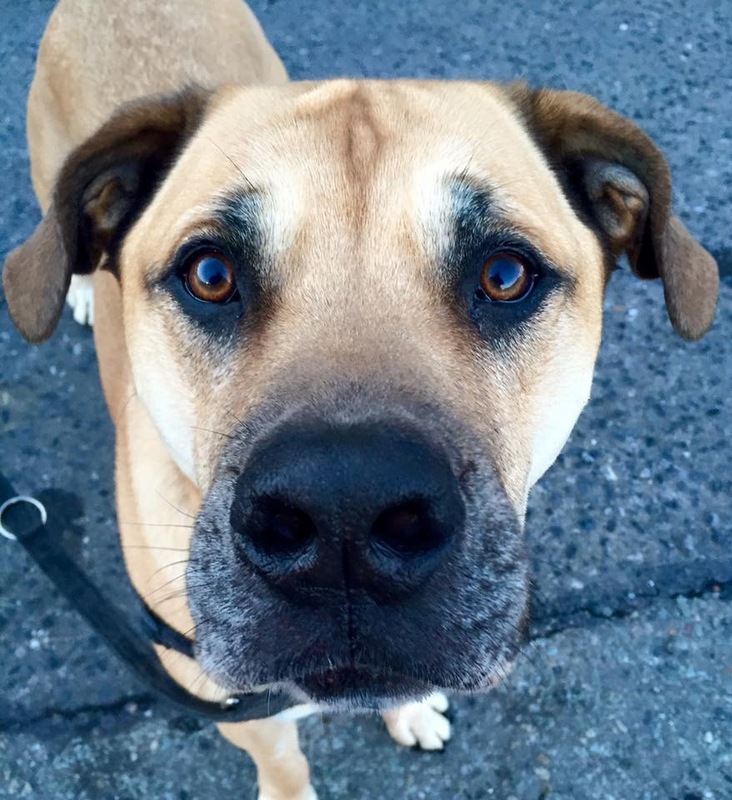 Teaching your dog that him seeing certain stimuli (might be other dogs, people, distractions or specific situations) mean to focus on you is a real training shortcut – that means that as soon as your dog sees one of these things he immediately looks at you, gets into focus mode, and all you need to do is to reward him! Practice for 1-2 minute sessions and then take a break. Have a few sessions today and tomorrow. Kids are often great dog trainers. Teach each child how to play this game safely – have your child sit in a chair to practice. If your dog is mouthy, jumpy or likely to get over-excited it might be best for you to get the behaviours established and then bring in the kids to help with practice. Always supervise child-dog interactions and make sure children learn to leave the dog alone when eating his rewards. Start working on these games in really low distraction situations. 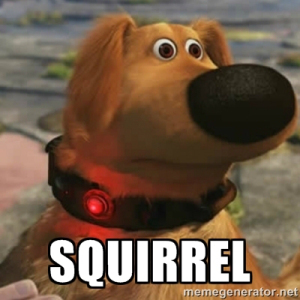 What really gets your dog distracted or excited? Might be other dogs, passing people, squirrels or interesting smells. Well, don’t start working around those until you can ace these games in other situations first. Start this exercise by practicing some Find My Face! in a low distraction situation – this might be on a quieter street area, in a quiet spot out on your walk or in the garden. Wait for your dog to choose to find your face; YES! and reward. Repeat. Practice this game of passive focus in mildly distracting situations. Note that we don’t ask her to check back in, instead just wait – lazy dog training! 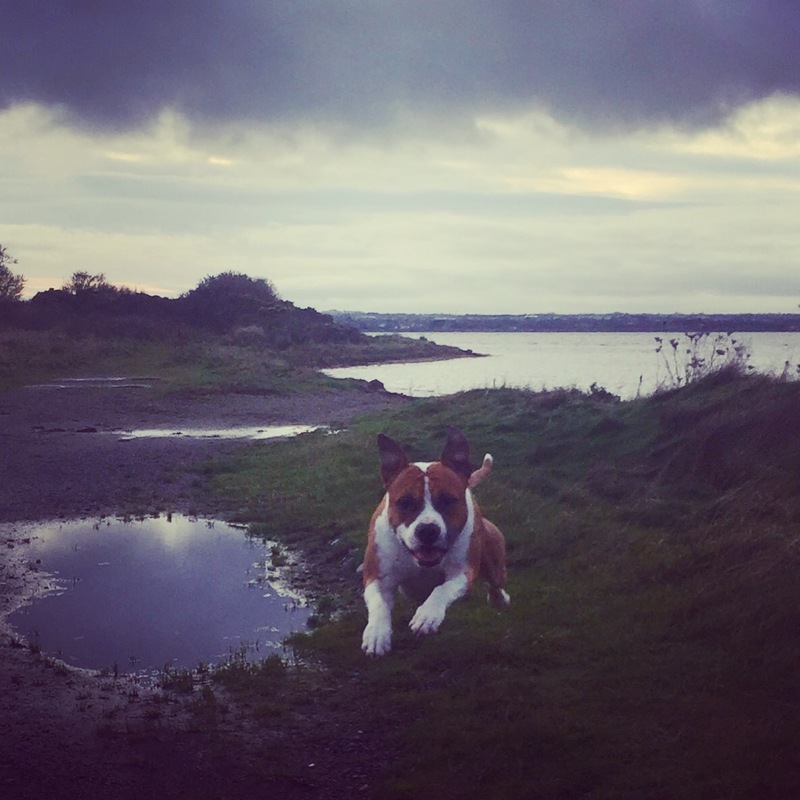 Getting to, through and out doors is generally met with lots of excitement and enthusiasm in dogs – it’s just so rewarding on the other side! Teaching your dog to be calm, patient and focused on you at doorways will not only make life easier but potentially safer too. 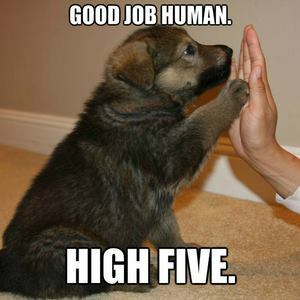 Without even asking him, we can teach your dog to automatically find your face inside, through and outside each door! Calm, happy, focus is so often our training-dream; a dog who will respond even when there are distractions and who enjoys working in partnership with his person, in all sorts of situations. We can achieve calm, happy focus in distracting situations with careful training. By teaching your dog to focus in lower distraction situations we can continue to build on this success by carefully introducing slightly greater distraction levels in increments. Disclaimer: this video was made for demonstration purposes only; Decker or any dog did not suffer any distress during or after this work – please don’t worry! In response to trainers who show similar scenes with their dogs wearing training collars, shock collars or training equipment, this is a dog who has been worked and trained with rewards-based training – there are no training tools or treats or toys used here at all showing that dogs trained this way can work in very distracting situations, without ‘cookies’ and through choice. What do I need for week 4? I can check in with my person even though I would really like to sniff, run around and explore and I can wait to access the things I want. My self-control is developing – I can’t have all the things I want, when I want them. Passing in or out of a door is a cue to check in with my person and wait patiently. Learning to stop and check in with my person will keep me safer. Of course calm, happy focus doesn’t need to be a training dream – it can be a training reality. You can download a more printer friendly, but abbreviated version of this week’s exercises here. Just like people, dogs don’t work for free and if we want them to do behaviours for us, we gotta make it worth their while. Because some behaviours can be trickier than others, the rate we pay will also need to vary appropriately. Lower value rewards work best for easier behaviours and higher value rewards work best for harder behaviours. Is it just about food rewards? 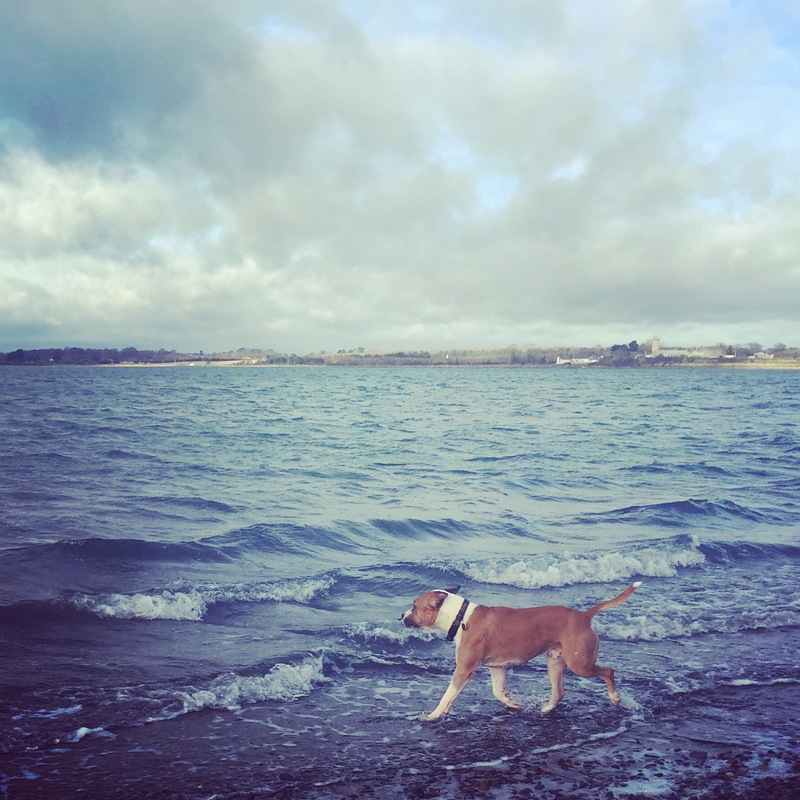 We want our dogs to want to carry out the behaviours we want them to do – to achieve that we need to work out what motivates them, and then teach them how to get those things. By teaching our dog to be a good human-trainer, they will learn to carry out behaviours that cause us to release motivators. Motivators come in all shapes and sizes, and are often individual to each dog and sometimes to breeds or types of dog. 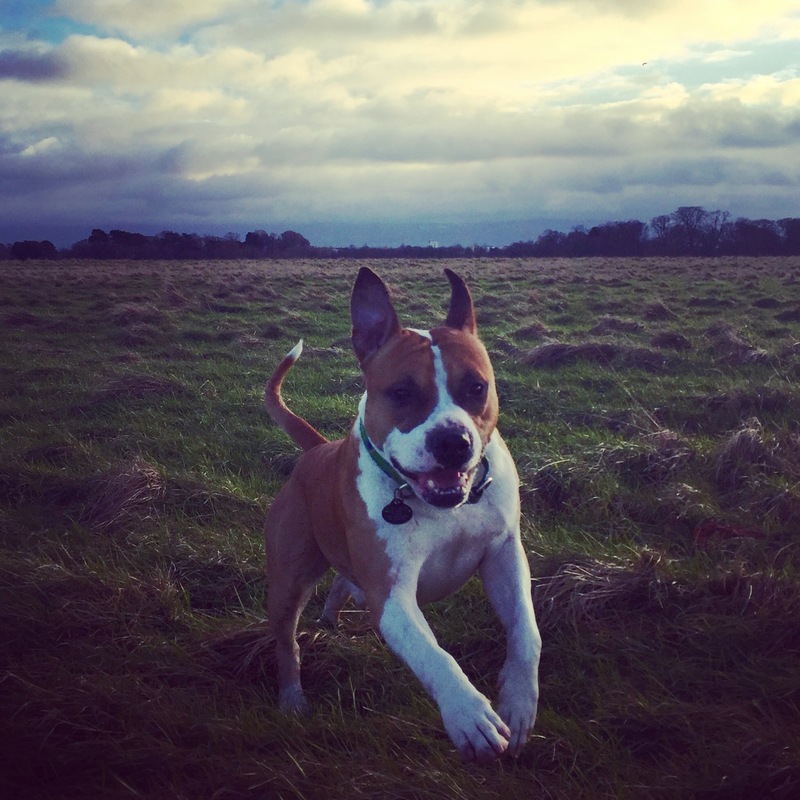 Anything your dog likes access to or likes to escape from can reward their behaviour. Out of these things, ones that you can control are most useful in training. Make a list of the things that your dog likes. Grade the value of the rewards in your list. 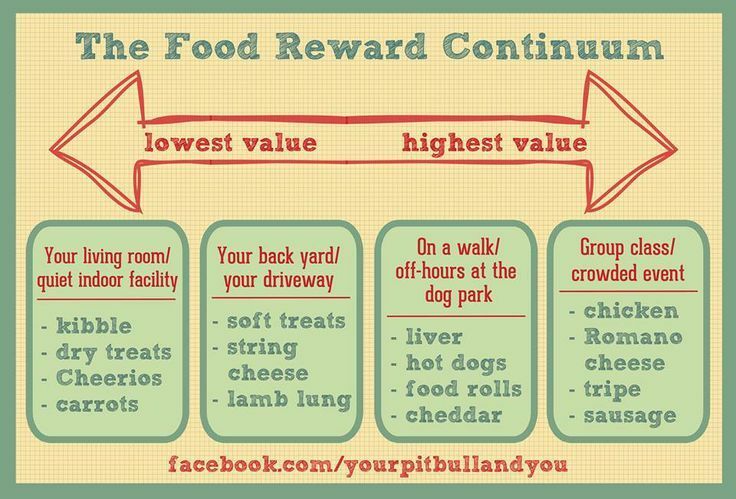 This way you will have a better idea of higher or lower value rewards that your dog will work for. It’s often best to use the lowest value rewards that your dog will work for in a given scenario – keep your big guns for when the going really gets tough! 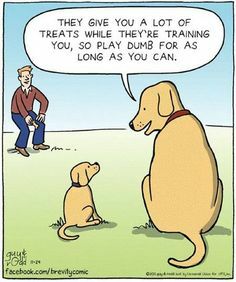 I am sure you have noticed that sometimes your dog isn’t interested in the things you have to offer…distractions will compete for your dog’s behaviour, making training harder. Distractions are just rewards that your dog wants more than whatever you have to offer, right now. what is your dog distracted by? what would your dog rather be doing when you would like him to do something else? Just as you did with your rewards list, grade these distractions – just how distracting are they? Now you have lists that allow you to balance rewards and distractions. Something high on the distraction end of the list will require rewards high on the rewarding end too! 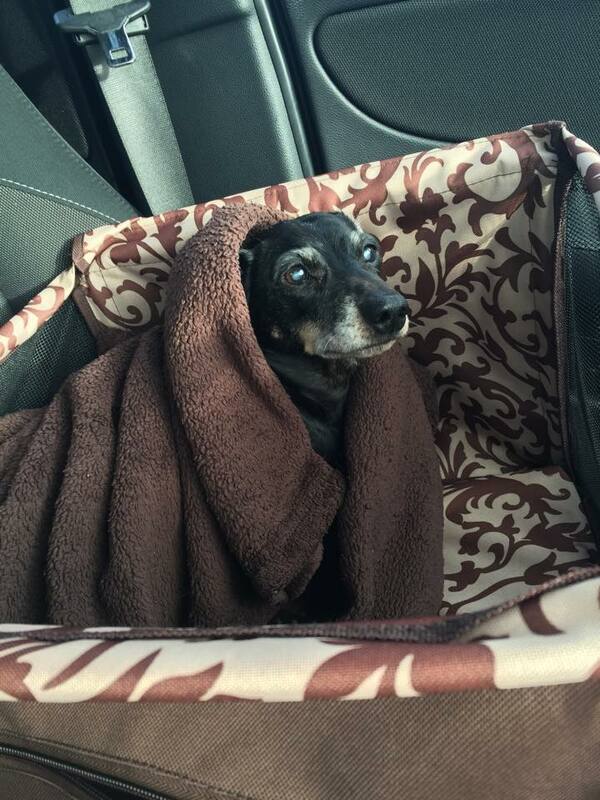 What do your dog’s lists look like?